Any student absent without the school's knowledge is considered to be truant. Instruction missed will not be provided, any assessments missed (including tests and presentations) cannot be made up, and the truancy will be dealt with as a disciplinary issue. We recognize that regular attendance correlates to academic success and connectedness to school. 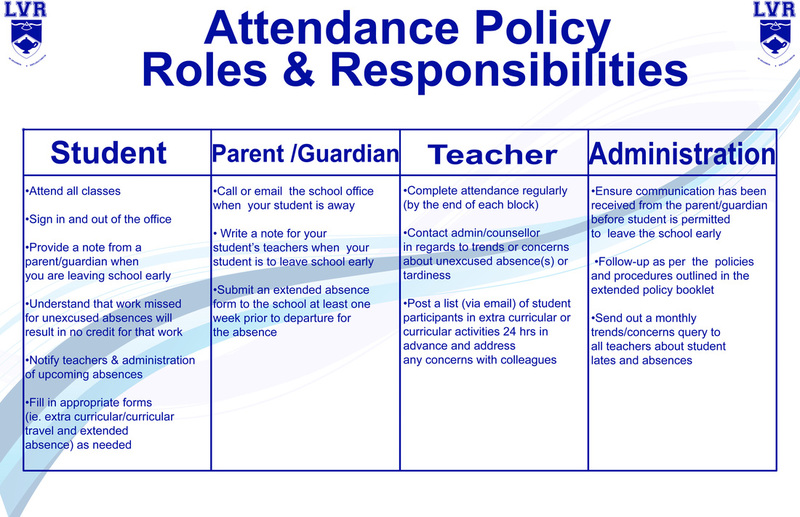 Irregular or chronic absenteeism not only leads to diminished academic success, but will also warrant a conversation with the student and parents/guardians to identify strategies for regular attendance, or special programming supports as necessary. Senior students in particular who stop attending or have extensive attendance issues without reasonable cause, and despite consultation and interventions may be removed from classes or withdrawn from school. We also know that attendance can be a challenges for students with anxiety, illness, families in transition, and other irregular circumstances. In these cases, our Student Services team and administration will work with students and families to support attendance, and/or provide programming and educational supports and alternatives on a case by case basis. That may look like: consultation with teachers for adjusted programming, partial attendance, blended learning program (distance learning and face to face courses), in addition to Counselling and Community Agency supports and interventions. We encourage students to participate in school life, including sports, extra-curricular, and including community clubs and teams. In many cases, students may be leaving to participate in tournaments, special events, or competitions. In these cases, we ask that students complete an extra-curricular absence form (available at the Office) and have it signed off by teachers at least 48 hours in advance. Coaches and teachers who take their students on field trips will post lists of students who will be absent so that staff are aware and can adjust their planning accordingly. We've also been in contact with community teams so that rosters and schedules can be provided and posted. Awareness and communication are key to being proactive! In some cases, a blended learning program of face to face and distributed learning courses may be viable options to accommodate students in these circumstances. For students and their families who are planning a vacation outside of regular school holidays and closure weeks, please know that it is your responsibility to let your classroom teacher know well in advance--at least two weeks, so they may consult with you on how to best proceed with your learning program. Teachers do their best to plan lessons, and labs, projects, and hands on learning are difficult to make up or replicate. There is no obligation for classroom teachers to assign work or asses work while your family is on vacation, or if your son/daughter has an extended absence. For absences two weeks or more, we urge parents to let our office know if your family is planning an extended absence so that we can be proactive in our communication with teachers. For planned absences of a month or more, at least a semester prior consultation with administration to the coming school year is preferable: examples include student exchanges abroad. Students who return from a partial semester of travel, including exchanges or out of district academies, please note that LVR cannot hold seats or promise a full slate of face to face educational programming.